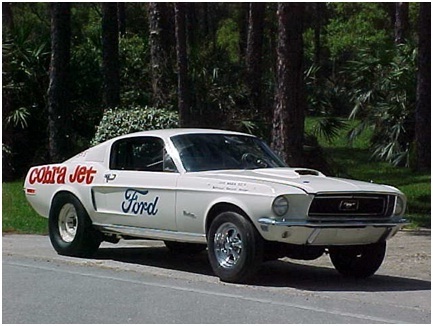 This remains one of the best known 135 cars as it raced extensively, held an NHRA speed record, and has been beautifully restored to include the original Cobra Jet logo. This car raced in SS/E in the early seventies under the name of Turley and Caster when it set a speed record of 125.46 MPH. Today the odometer reads a mere 1450 miles and the car has the original sheet metal and period correct wheels and tires. Race modifications include: 6 point roll cage, Autometer tach, MSD ignition, tubular headers, scatter shield, and slightly rolled rear fenders for tire clearance. The paint and engine was redone in 1970. The car has appeared in many car magazines including the June 2003 edition of Mustang Monthly. 8F02R135012 was offered for sale at the January 2012 Mecum auction held at Kissimmee, Florida. It received a top bid of $140,000 and failed to sell.